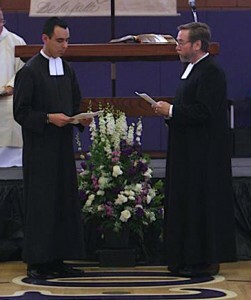 Brother Christopher Patiño recites final vows with Brother Donald Johanson, Visitor of the District of San Francisco. In an auditorium filled with more than one hundred family members, friends, students, and Brothers, Brother Christopher Patiño made his final vows as a De La Salle Christian Brother on Sunday, June 9th. 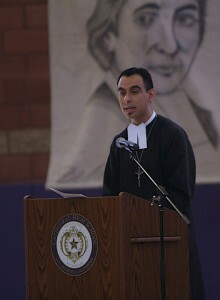 The mass of final profession was celebrated at his alma mater, Cathedral High School in Los Angeles, CA. After the ceremony, Brother Christopher thanked the many individuals who helped lead him to this occasion of celebration, including his parents, sisters, friends and colleagues. He also acknowledged the role of his fellow Christian Brothers in accompanying him on his path of faith and vocation formation. Brother Christopher received the habit in September 2007. He taught at Cathedral High School from 2008 to 2012, when he was assigned to his current position as religion teacher and Dean of Discipline and Student Services at San Miguel High School in Tucson, AZ.